These batteries are sold wet with electrolyte. They can be ordered dry for no additional cost, but electrolyte is not included. Because batteries are hazardous, it is required that they be dry to transport them by aircraft. It is also desirable when exporting them to other countries. Please call to order if you need them shipped dry. 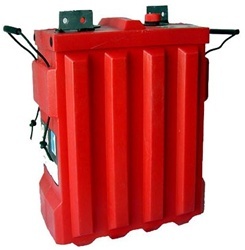 When exporting Rolls batteries overseas exporting crating is required. Export crating is 5% of the total cost of the batteries.